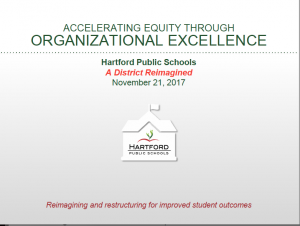 Posted on November 22, 2017 November 22, 2017 Author Robert Cotto Jr.
A second portion of the Superintendent’s plans with more detail will be presented in December 2017. Another presentation and public hearing will happen before the school board votes on final details and recommendations. There are multiples thing happening here. The district wants to improve academic outcomes while grappling with State resistance to the Sheff and CCJEF cases. Also, there are consequences of planned and unplanned intra- and inter-district school choice. The troubles range from lack of district capacity (e.g. organizational excellence), financial sustainability, and uneven enrollment size across schools (e.g. small schools, concentrated student need), and need for more attention to the core work of teaching and learning, to name a few. The obvious concern is: what changes? Within that concern are more questions: How might schools look in terms of grades offered (e.g. K-5 or K-8, 6-8)? What sort of curricula, resources, and opportunities should each school have (e.g. core subjects, art, music, guidance, phys. ed, etc.) Which schools might be consolidated together? Which might be closed? Which new schools or programs might open or replaced current ones? What are the benefits and drawbacks? Who is ultimately served by any changes? To a large extent, this process is revision of and response to the Equity 2020 committee plans from a year ago. That situation, which I wrote about here, was disastrous in terms of impact on the community. That plan simply picked the most vulnerable schools and listed them for closure and/or consolidation. Unlike the Equity 2020 committee work, this project is led by the Superintendent and seeks public input in person, phone, or online. 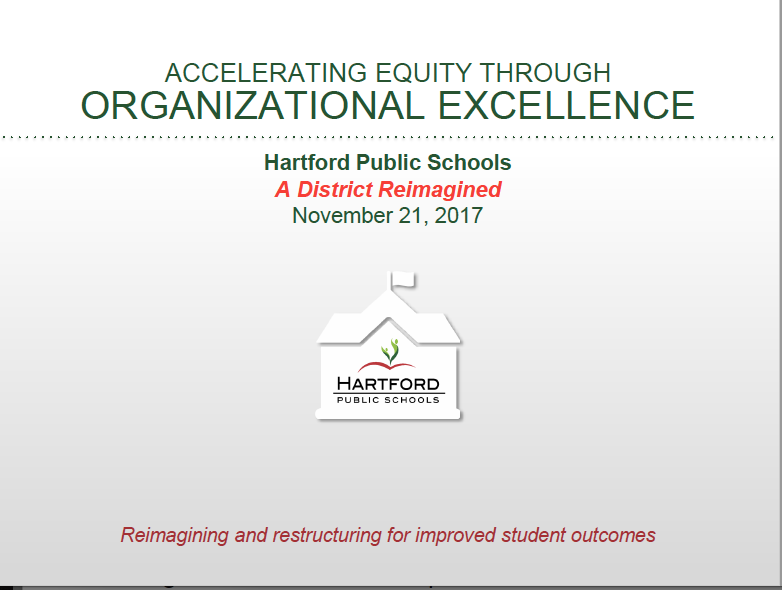 Here’s the link again: https://www.hartfordschools.org/feedback/. Previous Previous post: What are charter school entrepreneurs selling in Connecticut this year?